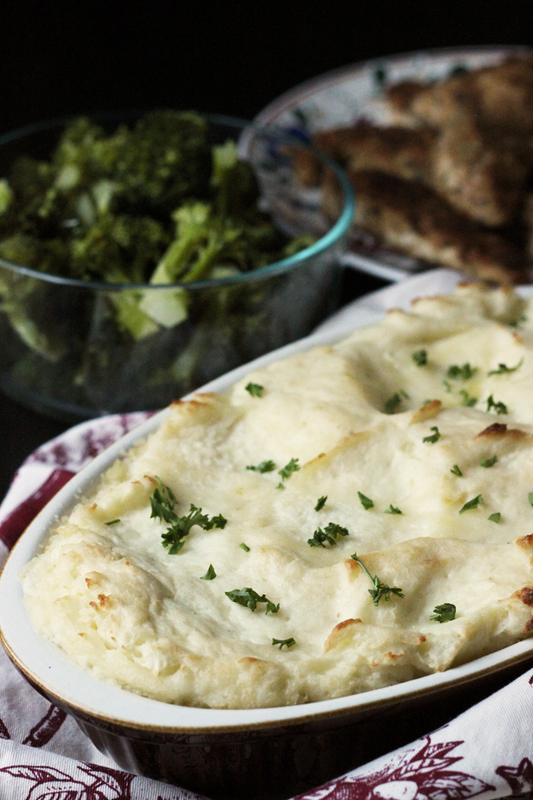 Need a comfy side dish? 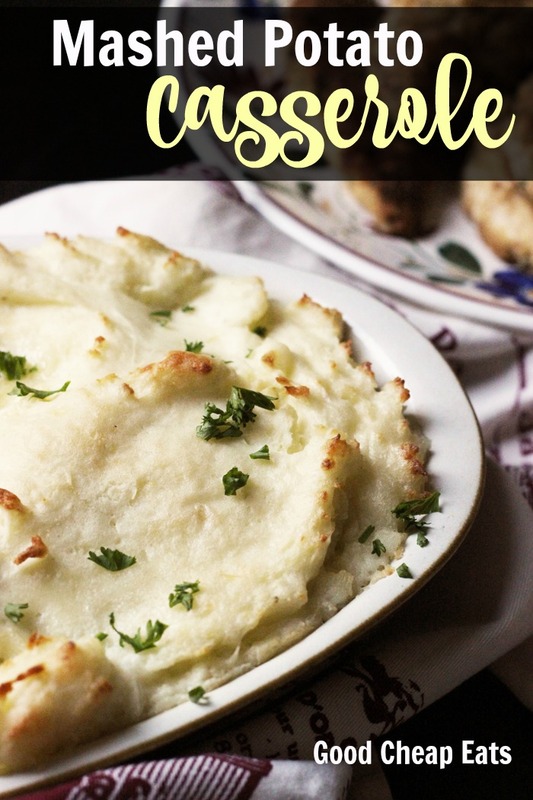 Make the Mashed Potato Casserole my kids go nuts for. It’s very make-ahead and as easy as can be. I’ve been making mashed potatoes for my kids since they were really little. It was probably one of their first foods, now that I think of it. So easy to feed to babies and if you make it thick and lumpy, it is, indeed, a finger food. 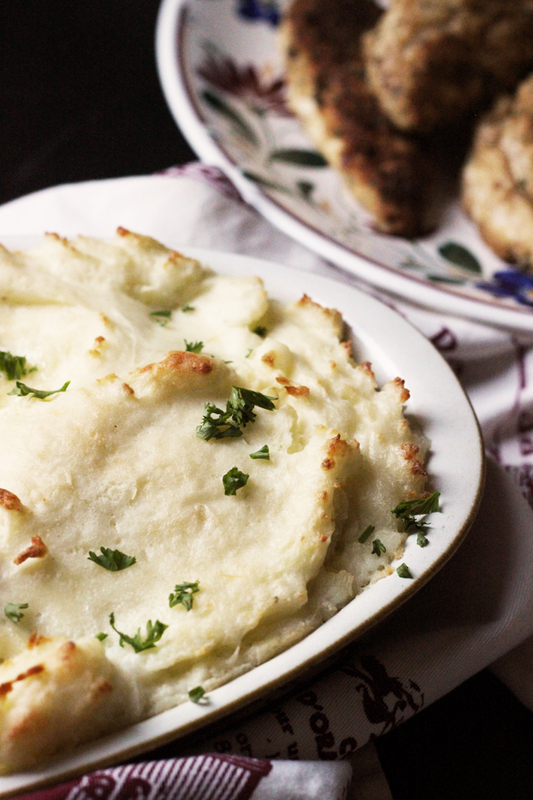 Mashed Potatoes has long been a family favorite side dish. I make at least five pounds’ worth at the holidays and there may or may not be fighting over who gets the leftovers. Though truth be told, I’m happy to call it a main dish. I could just eat mashed potatoes and veg and call it a night. A very good night. 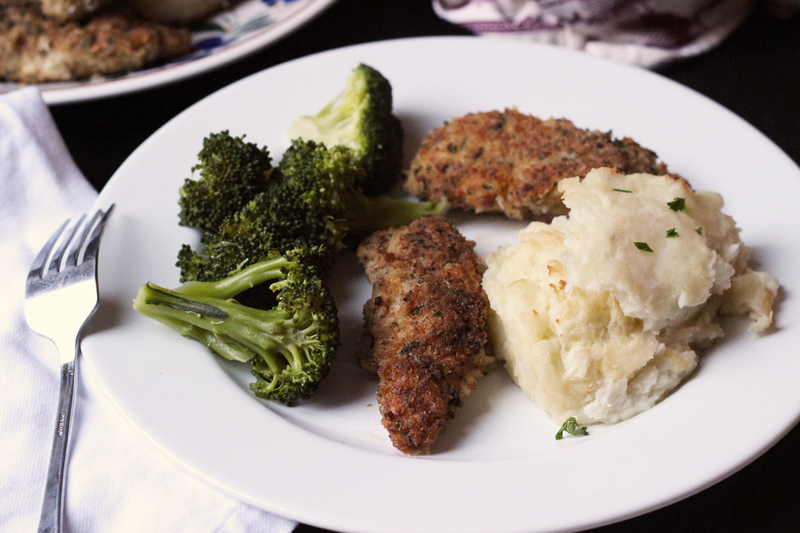 Imagine my surprise when my kids started going nuts over a small tweak I made to my regular mashed potatoes recipe. One night I was pretty much making it without a recipe, just going about my business. I blended in cream to make it smoother and stirred in some roasted garlic for flavor. Since the main dish wasn’t ready yet, I slid it into the oven to bake while I finished dinner. And the crowd went wild! The kids likened it to the Garlic Mashed Potatoes we get at Stonefire Grill when we head north. Translation: high praise. FishChick8 calls it Baked Mashed Potatoes and they are really the only mashed potatoes she wants to eat now. Go figure. Stock up on ingredients when they are on sale. When I find regular kitchen staples on sale, I buy a lot. I’m currently using a price book to track prices and that’s saving me money. For this recipe, keeping an eye on the price of potatoes, cream cheese, cream, and butter can help keep the price down. Hint: potatoes often go on great sale in March and November, so keep your eyes open! Buying in bulk – It’s rare that I would buy a small container of cream. I buy the half gallon at Costco which is a little cheaper than elsewhere. One of the loveliest things about this recipe is that you could make it in a bulk batch and freeze it. While white potatoes can get mealy when you freeze them, as long as you add enough fat (butter, cream, cream cheese), they will do reheat well after freezing. potato peeler – unless I buy organic potatoes, I always peel my spuds. This is a great one! potato masher – If making a single batch, I usually mash these by hand. You can also toss the hot potatoes into the bowl of a stand mixer. Just don’t walk away as potatoes can get gluey if over mixed. prettier baking dish – 9×13-inch pans just are pretty, are they? I pile these potatoes into prettier casserole dishes just for looks. In a large pot of salted water, bring the potatoes to a boil. Simmer for 20 minutes or until very tender. Drain completely. Return the pot of potatoes to the heat for a few seconds, stirring, to allow any excess water to evaporate. With a potato masher, mash the potatoes until very fine. Add the cream cheese and continue mashing until the cream cheese is fully incorporated. Stir in enough of the cream to achieve a smooth, but still spoonable texture. Stir in the roasted garlic pieces and cheddar cheese (if using). Season to taste with salt and pepper. Spray a large baking dish with nonstick cooking spray. Preheat the oven to 350 degrees. Spoon the mashed potatoes into the prepared dish. Dot the potatoes with the butter and bake for 30 minutes. The casserole can be wrapped, chilled, and frozen before baking. To serve, thaw overnight in the refrigerator before proceeding with the baking step. wow, this looks and sounds great!! it is closely related to a dish called ‘make ahead mashed potatoes’ my darling mother made during the holidays. My mom, bless her, was not a cook, and just managed to follow recipes over the years to feed her 8 children, but I have no fond food memories from my childhood. Mom found the recipe for this potato dish, and she loved that she could have it prepared and ready to go except for popping it in the oven, for holiday gatherings. I must say that there was no roasted garlic in mom’s dish – that would have been beyond her culinary efforts. In all fairness to my mom, she grew up the child of two Irish immigrants who started a restaurant in Georgetown when mom was 10. Her parents had lofty aspirations for my mom, and they didn’t involve learning to cook. But mom was fabulous anyway!!!! Saw this in your letter and made it today for tomorrow. Thanks! Merry Christmas. Hope you enjoyed it as much as we do! Happy New Year! I make mine similar to this sort of like Pioneer Woman’s but without the baking. I will try this next time. By the way, in reading your November ramble you mentioned having vertigo. Have they tried the Epley maneuver on you? I get this now and then and the maneuver has helped. There is also another one called the somersault maneuver that I am going to try. I started PT two weeks ago. Lots of different maneuvers to get things back where they’re supposed to be. One caution before you try new things: my PT said that certain exercises will make it worse, depending on which canals have issues and the type of vertigo it is. Maybe check before you experiment!